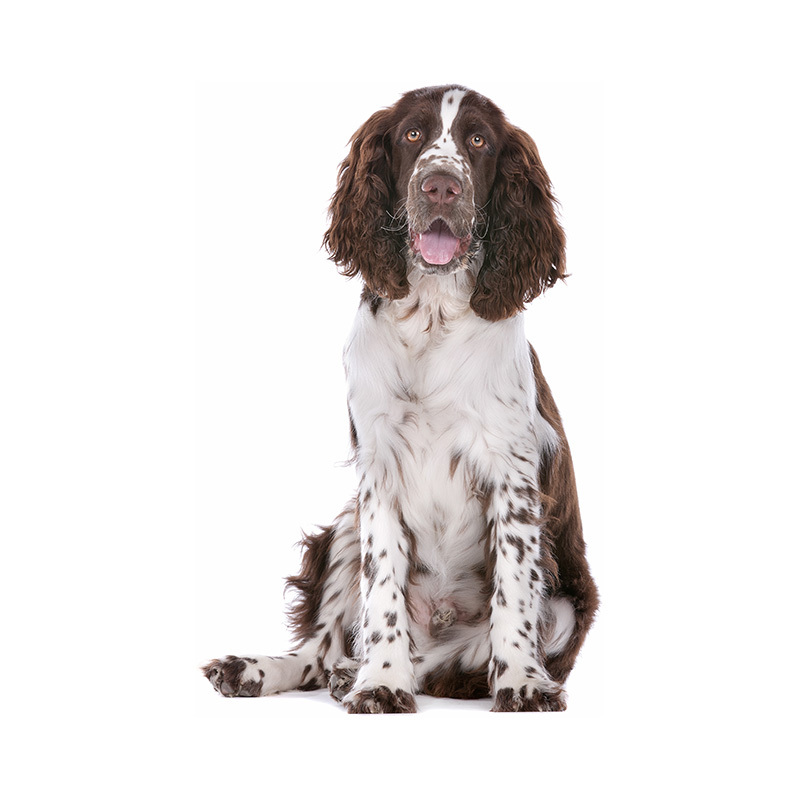 The English Springer Spaniel is the foundation for all English hunting spaniels. Spaniel-type dogs are thought to have originated in Spain many centuries ago and were probably taken throughout the world and to England by travelers via trading ships. Spaniels were mentioned in Welsh law as early as 300 A.D. were and depicted in 16th and 17th century artwork. The English Springer Spaniel was developed by hunters to flush game birds or small animals by “springing” at them, thus allowing their prey to be captured or shot. Interestingly, during the 19th and 20th centuries in England, dogs within the same litter were classified by their hunting ability rather than their breed. The smaller dogs were used to hunt woodcock and were called Cocker Spaniels, the medium dogs were the Field Spaniels, while the larger dogs of the litter who were used to flush or “spring” game were called Springer Spaniels. The English gave the Springer official breed status in 1902, and they have continued to enjoy popularity ever since. The English Springer Spaniel makes a wonderful family pet, as they are even-tempered, gentle, friendly, sociable and are wonderful with children. Some of the adjectives used to describe this wonderful dog are brave, cheerful, playful, energetic, intelligent, and skillful. With their tails always wagging, the English Springer Spaniel seems to love everyone. There are two types of Springers, the field lines and the show lines. The field type is bred for hunting and field trial work, while the show type is bred for conformation shows. While both types are intelligent and energetic and need daily exercise, the field type has a higher energy level and needs even more exercise. Springer Spaniels usually weigh between 45 to 55 pounds and stand approximately 18 to 22 inches tall. Their coat is close, straight, and silky. Their colors range from black to white to liver and white to black tri to liver tri. Spaniels are natural fowl hunters and should not be trusted with birds. They love water and may constantly get wet and muddy. Their talents include tracking, hunting, retrieving, agility, competitive obedience, and watchdog.